A strong storm system moved through the metro late Friday afternoon during rush hour. 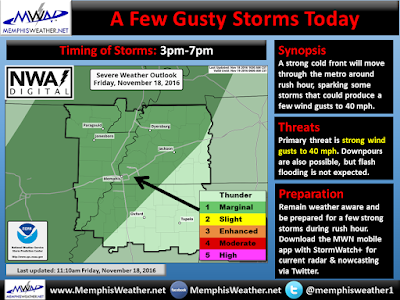 Though we were expecting thunderstorms and perhaps a few strong wind gusts of 40 mph or so, one cluster of cells in particular picked up steam as it entered Memphis proper and moved northeast into the Bartlett, Lakeland, and Arlington areas of Shelby County. The storm hit with a vengeance at MWN in Bartlett at 5:18pm with estimated wind gusts of 60 mph, wind-driven hail around the size of nickels, and torrential rainfall. Shortly thereafter, a Severe Thunderstorm Warning was issued for northeast Shelby County and points northeast of there. Trees were snapped and well over 25,000 MLGW customers lost power, some for as long as 15 hours. In addition, there was a large home that burned in Bartlett, possibly the result of a lightning strike (though not confirmed as of this writing). This storm system should serve as a reminder that November to early December is secondary severe weather season in the Mid-South due to strong weather systems sporting large temperature gradients moving through. Severe weather this time of year is NOT rare! (Ask the folks of Germantown about their Thanksgiving weekend tornado of 1994.) 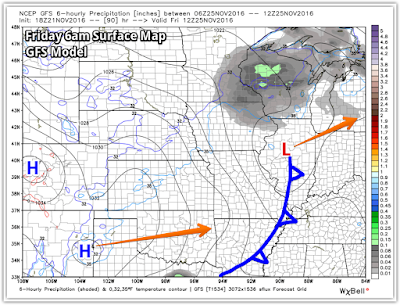 Even in a drought, a large change in airmasses is still a trigger that can produce severe weather with the right storm ingredients in place. This storm system didn't care about our severe drought. We're fortunate it wasn't worse. 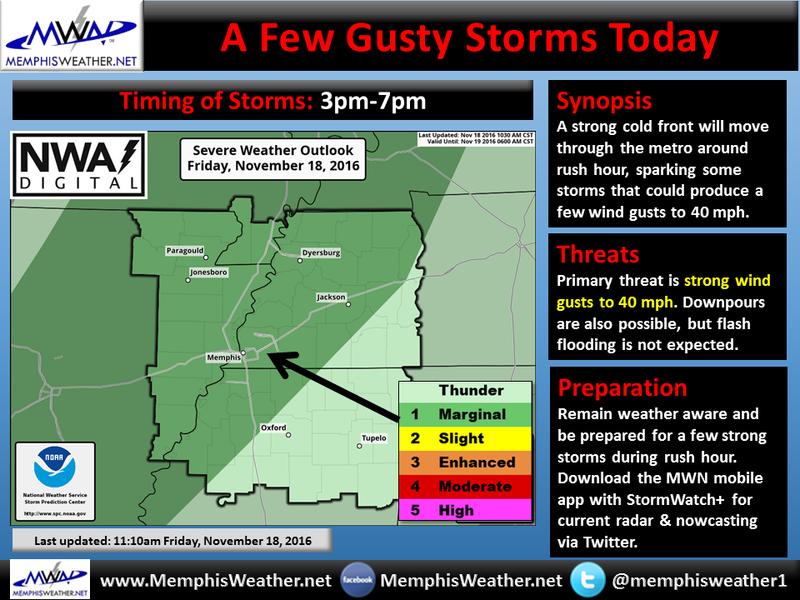 The impact graphic we posted late Friday morning advising of the potential for strong wind. The storm hit in the middle of our window of potential impact. Storms were just stronger than forecast. A Marginal Risk of severe weather indicates that the potential exists for a few severe storms, which is exactly what happened. 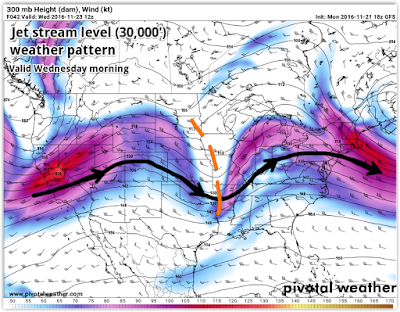 With the arrival of last Friday's cold front, we shifted to an atmospheric pattern more conducive to repetitive wether systems moving through the region than very warm and dry conditions under high pressure anchored over the southeast U.S. The high has broken down and the jet stream has shifted south, meaning that systems moving along the jet will be more likely to move through the middle of the country than the far norther reaches along the Canadian border. This, in turn, means more rain chances and also cooler temperatures. 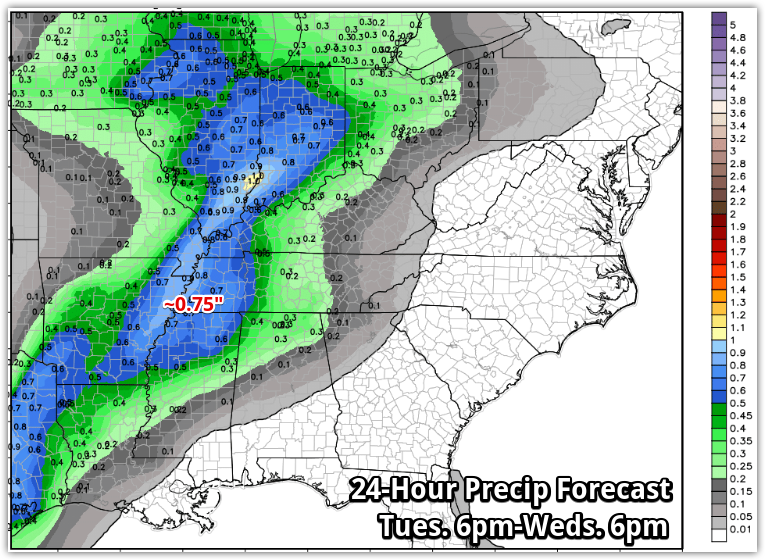 The next cold front to affect the region will approach on Tuesday night, tapping into a stream of Gulf moisture and bringing high rain chances. 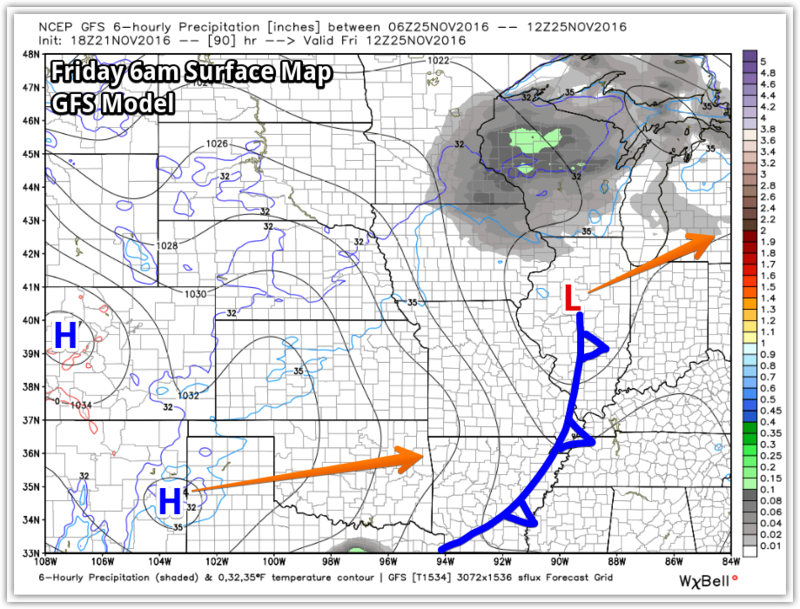 The front will be fairly slow moving and thus rain chances will be more prolonged than Friday's system. 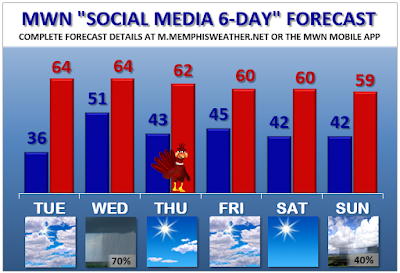 In fact, rain chances begin late Tuesday evening and continue well into the day Wednesday. 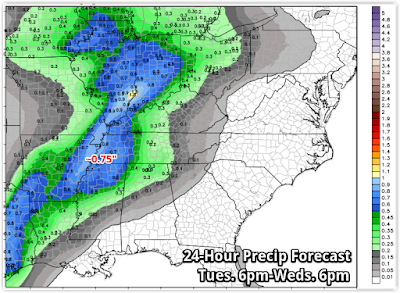 The period of heaviest rain will be after midnight through dawn Wednesday with scattered showers continuing Wednesday, as the cold front doesn't move through until mid-day Wednesday. Severe weather is not expected as the dynamics of this system are not overly impressive, though some rumbles of thunder are entirely possible, especially early Wednesday morning. Rainfall totals should end up in the 1/2"-1" range across the entire area - a welcome prolonged rain that should help the severe drought conditions a bit more. Travel conditions for Wednesday look to be inclement from the Great Lakes south through the OhioValley into the Mid-South to the western Gullf Coast. Air travel through Chicago, Detroit, Indianapolis,and Houston could be affected, while the east coast and Atlanta look good. 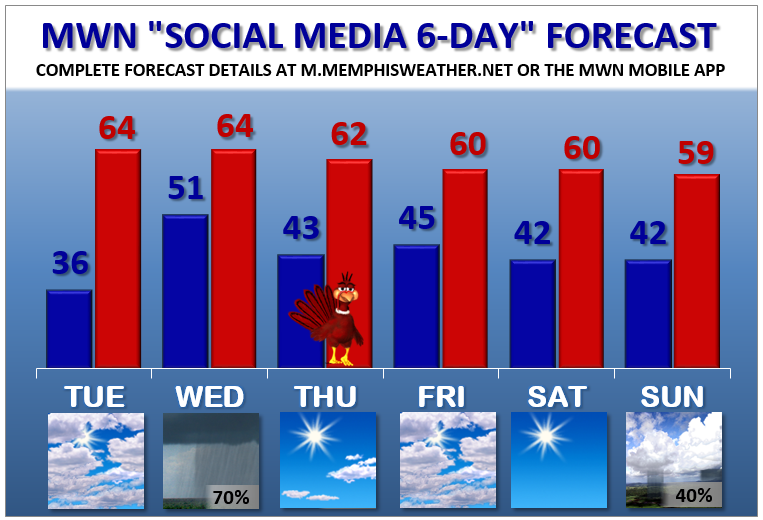 Regionally, for those driving within a few hours of Memphis, expect scattered showers with the best chance of dry weather heading west out of Memphis. The Plains, from Canada to Texas also look good, including Dallas. By Turkey Day, the sun will be back out with weak high pressure in control and temperatures near seasonal levels - around 60° for the high after a cool start to the day. It should be great weather for eating too much, then walking it off later in the day! Thanksgiving Day travel should be much better than the day before. If you have an interest in what to expect for the Macy's Thanksgiving Day Parade in NYC, temperatures will be near 40° with cloudy skies, light wind, and a chance of light showers. Very similar conditions are expected Saturday as we'll be between weather systems once again. Sunday through the early half of next week also looks unsettled with more rain chances and perhaps a few strong storms depending on the model solution one buys into. Certainly a much more active pattern than we have seen in a long time! Stay tuned for details on any severe weather chances as we're now in tune with the possibility that it could happen this time of year! 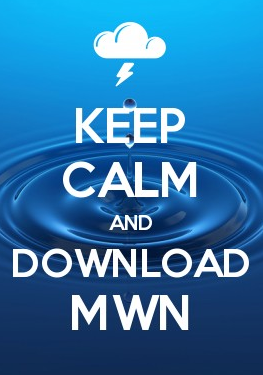 As always, you can get our latest thinking, plus radar, the MWN Forecast, and more in our mobile apps.